Two nights after Boston scored twice in the final minute to beat Florida 4-3, Krejci put home a shot from Danton Heinen in the waning seconds of the third to break a 2-2 tie. The Bruins are 15-0-4 since losing in regulation to the New York Rangers on Jan. 19 -- the team's longest such run since a club-record 23-game point streak (15-0-8) from 1940-41. Boston also swept a six-game homestand by winning its 10th in a row at TD Garden and eighth straight overall against the Senators, who are 1-9-1 in their last 11 contests. Ottawa's Brady Tkachuk broke a 1-1 tie 2:46 into the third period when he crashed the net to backhand the puck past Boston's Tuukka Rask (17 saves), who is 10-0-1 in his last 11 starts. Chris Wagner tied it at 2-all, after he tipped in a shot by Torey Krug with 11:13 to play in regulation. From the start, Boston generated plenty of opportunities on the offensive end while outshooting Ottawa 12-6 in the first period. However, the Senators' Craig Anderson (28 saves), who has lost 11 straight starts, made some key saves to keep the game scoreless. Ultimately, Boston's pressure proved too much as Brad Marchand drove home a cross-ice pass from Krug with 9:49 left in the second on the power play. Marchand and Patrice Bergeron, who earned an assist on the goal, extended their own personal home point streaks to 15 games. 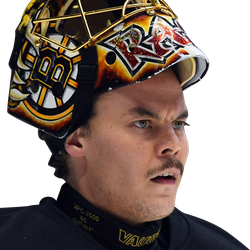 A Boston turnover opened the door for Jean-Gabriel Pageau to rip one by the glove of Rask to tie the game with 8:52 to go in the period. Pageau, who missed the first 42 games of the season with an Achilles injury, has two goals and three points over his last four contests.